Is WiseEssays.com a Good Writing Service? Read! The biggest problem about WiseEssays.com is lack of transparency about the prices. The price chart only gives you the quote of $11.96, but the real prices that you see in the order form are much higher. Plus, the quality these writers deliver is not that great. At first sight, the website looks good. It gives you basic information about timely delivery, support, and safety. As always, we first take a look at the prices to form an initial impression, and that’s where the first disappointment kicked in. There isn’t a clear price chart at this website, so you don’t know how much you’re going to pay before you actually access the order form. The live chat also seemed really cool. It gives the service that “serious” vibe that you expect when ordering papers online. But the first impression is just that – a first impression. We always give a writing service an actual chance before forming the final opinion. So we ordered a paper. Read our review to see what happened. There’s a nice list of services separated in few categories: academic writing, dissertation services, admission services, assignments, and editing services. Most types of papers for high school, college and graduate school are available in that list. As an example, you can order essay, term paper, research paper, case study, thesis, dissertation, multiple choice questions, admission essay, and more. The company also offers group projects, which is something new in the list of services we’re used to seeing. But some really important types of papers are not available. For example, you can’t order an article critique, programming assignment, or business report. This is where the problems start. The price calculator at the home page says the prices start at only $11.96. The Prices page tells you the same thing. So if you order a high-school level essay with a deadline of 10 days, you’re supposed to pay $11.96 per page. But that’s not the case. When you access the order form and use those parameters, you get a price of $14.95 per page. The difference is only $3, but it’s not that insignificant if you order ten pages of content, is it? Even if you apply the discount for a first order, the price per page is $12.26. As for the highest price, it’s $43.95 per page, and it’s set for PhD level with a deadline of 6 hours. The Discount page says you’re getting 20% off for your first order. But at the home page, there’s a featured first-time discount that gives you 18% off. That’s yet another inconsistency. For the second order, you’re supposed to get 25%. But I’m not sure the customers return here. 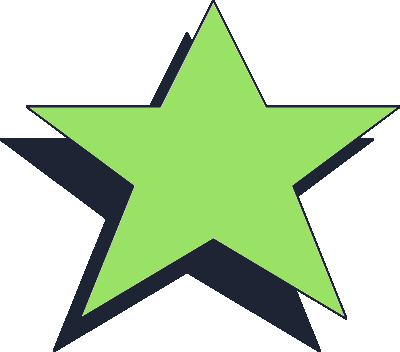 After the experience we got, we removed WiseEssays from our list of potential writing services to use. The paper was not good at all. 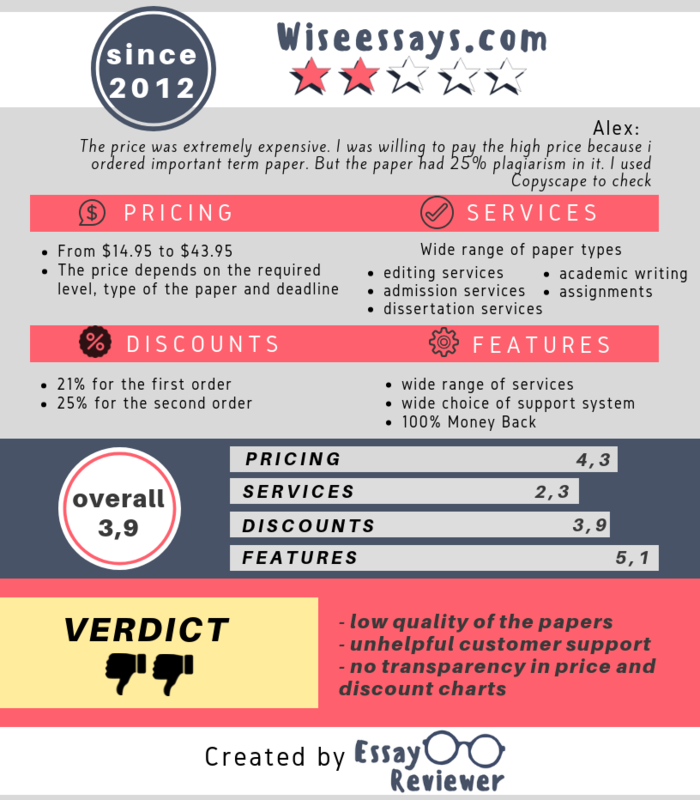 We ordered an essay of Undergraduate level with a deadline of 4 days, so we paid a price of $22.95 per page. That’s not a huge price for such an urgent paper, so we were okay with it. The quality of the content, however, was not good enough for this price. At the website, you can see a claim that only experienced writers work in this team. They are supposed to have relevant educational background and extensive working experience. When we got a paper below the Undergraduate standard, we asked for information on the writer’s education and experience. We didn’t get an answer. And we did not get the reviews that this paper totally needed. The writer did not stay on topic; he just rambled and the essay was suffocated with fillers. Zero resources stated and zero relevant arguments made. I wouldn’t say that’s a high-quality essay. Would you? The live chat is nice. It fast and it works well. It gives you some basic information about the price and guarantees. But when we tried to get free revisions, which the team is supposed to offer, we didn’t get the response we expected. The customer support agent made us wait for days, and then the 14-day period during which the team guarantees revisions was gone. They played a trick and we didn’t get the revisions. In addition to the live chat, there’s also a phone number and email address provided at the website. In addition, there’s a fax contact option. I supposed that’s beneficial if you want to send some materials to the writer. But I’m not sure it works. We’re always happy to find another writing service that meets a student’s expectations regarding quality, price, and transparency. Unfortunately, WiseEssays.com is not one of those services. Lack of transparency is the biggest problem: you get a price in the order form that’s different from the one the service claims at its homepage. We still got an affordable price. But we were not happy with the quality and the support. The writer did not deliver a decent paper. It was just vain content full of fillers. The customer support agents did nothing to help us get the well-deserved revisions. In fact, they deceived us into believing that the writer would handle the revisions, but then the period for free revisions was gone and we got nothing. Overall, WiseEssays.com is not a service we’d trust again.